Q2/Q3: Planned for 2nd or 3rd Quarter. Corrected: Items that have been recently addressed or corrected. View all of our recent updates and corrections here. Suggestions under consideration: Items being considered by our product teams. NP: Request noted, no plan to add at this time. We are aware of and working to fix the following issues. Corrected Unable to add an alphanumeric Unit Number when performing a Tax Record search in Listing Management. Corrected Lot Size Dimensions and Land Use Code not autofilling from the Tax Record. Q2/Q3 When uploading photos from Safari, the photos don’t resize and auto crop to a zoomed upper right corner. Q2/Q3 When entering an open house, the time in the listing management preview screen appears incorrect. However, the correct time is available in listing search. NP Some of the display fields cannot be sorted in Search, like Levels/Stories. The system can’t sort when multiple selections are possible in Listing Management. Corrected The MLS numbers for the listings associated with the property are now sorted in chronological order on the 360 Reports. Corrected When looking at an individual office from the Agent or Office Directory of Search page, you are not able to sort the agents listed on the Our Agents Search page by First Name, Last Name or any of the column headers. Corrected Exporting Mailing Labels was not including the Street Directional Prefix. For example, for 1009 S. 46th St Philadelphia, it was missing S.
Corrected On the Directions report, only the street address was displayed. When you click a listing from the auto email, you are not directed to that particular listing in the Client Portal. Listings that were marked as Discard are showing as Favorites on the Recent Portal Visitors section of My Dashboard. Corrected House Model Name Field is incorrectly populated. 30 House Model Name Field is incorrectly labeled as Structure Type. Corrected A credit was switched to a charge and a charge to a credit on Seller Net Sheet reports that were emailed. They displayed correctly to the agent but were emailed out wrong. Corrected When selecting the municipality of Tredyffrin Township, the transfer tax on both the Buyer Closing Costs and Seller Net Sheet show as 1.75. This value is incorrect and should show as 1.25. Corrected When loading a Buyer Closing Cost with a dollar amount for a down payment, the Buyer Closing Cost loads it as 0. Corrected When doing a Buyer Closing Cost, the FHA loan limit is 6%. We added an error message for users to not make a seller assist greater than 6%. However, when 6% is entered, the Buyer Closing Cost will not let the user continue. Corrected Saved Buyers Closing Cost either do not load or load incorrect information on mobile devices and Mac OS. Corrected When creating a Buyer Closing Cost or Seller Net Sheet, if you do not preview the report before emailing it, the email report link will not work. Corrected Changing the Loan type clears out your preferences for certain fields. Corrected Seller Net Sheet is not always retaining a change to the transfer tax. Corrected Saved Deed or Mortgage recording amounts will appear on the Buyer Closing Cost when you start from scratch. However, when you auto fill this information from a listing, the saved fees get replaced. Corrected On Seller Net Sheet, Transfer Tax was not always populating to the report after an update or change was made. Corrected When loading Buyer Closing Costs from a listing or parcel, a user’s preferences for Deed and Mortgage Recording Fees were not populating and being overwritten by the county default values. Corrected When a Loan Type is changed in Buyer Closing Costs, fields that don’t apply to that loan type are hidden automatically. Any preference amounts that were set for one of these fields did not carry over. Corrected The Reimbursements and Escrow sections of the Buyer Closing Costs were not calculating taxes properly for some properties in New Jersey. Corrected When a Seller Net Sheet is created and emailed before previewing or saving it first, the email link was unable to be opened by the recipient. Corrected On the Buyer Closing Costs and Seller Net Sheet, School District defaults to the first school district listed when there are multiple school districts in the selected municipality. This was an issue for Lancaster, as Conestoga School District is the first school district listed but over 90% of the properties in Lancaster City are in the Lancaster School District. 30 Not able to load a listing from Washington DC into the Buyer Closing Cost or Seller Net Sheet. 30 When going from a listing to a Buyer Closing Cost, the Condo/ HOA fee does not populate prorations. 60 On the Seller Net Sheet, when changing Zoom Level to 100% or lower, drop-down menu works. For anything over 100%, the drop-down menu doesn’t work. Q2/Q3 “Act as” error message appears when you attempt to act as another subscriber from a page that does not support that functionality. Agent’s head shot is sometimes not getting updated on the right hand side corner. The following changes have been requested and are scheduled or being considered by our product teams. NP Don’t suppress fields until information is added. Subscribers find it hard to locate fields since they shift depending upon if info is added. Adding the ability for an agent to reply directly when a client sends an email through the Client Portal. 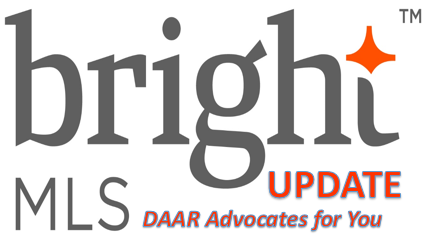 To submit a technical issue or view the most recent news and updates about Bright MLS, visit the DAAR Bright MLS Resource page.